Sumbookkeeper – I hate bookkeeping ? But I know I have to do it. I have owned my bookkeeping business for the last 8+ years and have done bookkeeping for 10+ years. I love business and I want to make bookkeeping a more simple process for owners who are just starting a business or who have started a business. As a new business owner it is a very real possibility that hiring a bookkeeper is not an affordable cost and taking it on in the beginning is what you have to do. A lot of why bookkeeping is thought of as an annoyance is because it tends to take a back seat in the beginning and as a result things can become a mess quickly. Lost receipts, forgotten start up costs, potentially missed filings. This is when business owners tend to have their first road block. What are a few tips that can help us get organized in the beginning? A. Open an excel workbook. On the first worksheet, record any start up costs that may have been paid personally and not through the business cards. Include the Date, the vendor (staples etc…) type of expense ( equipment or legal fees etc..) the total cost and the hst if applicable. B. Start another worksheet to include any other ongoing expenses that may have been paid personally. It is recommended that all business expenses be paid through the business account, but sometimes this doesn’t always happen. B. Download your business account activity on a monthly basis. Most banks will allow you to do so and to export into an excel spreadsheet. You will have most of the information like the date, vendor, total and you can then add columns to include type of expense and any tax if applicable. C. Make sure to save your receipts and highlight which ones you don’t have on your spreadsheets. D. Save your bank statements monthly. E. Save your invoices and deposit slips or get in the habit early of recording your payments when they happen. These are a few tips and I will tell you it goes a long way. If you end up hiring a bookkeeper, he or she will need this information and the more organized you are from the beginning the more money you will save. Visit us today. Sum Bookkeeper. What bookkeeping system to use? There are so many bookkeeping programs now. So how do you figure out what is the best for your small business? I don’t dislike any program but I would ask the following questions. What do you need? Are you a sole proprietor or are you incorporated? Do you need payroll or will you need payroll? Do you have inventory? …. Is the program user friendly? As a business owner will you be able to do entries if needed? If you make a mistake, is it easy to fix? Will you need training and if so is it offered? How is the customer support? Is it easy to grab reports? What are the bonus features? Is there tax support? Can you create a budget or forecast? Is there built in payroll? Is there a mobile app that allows you to use the program anywhere? Can you have multiple users and limit certain access? My favorite programs for small business are the following. B. Freshbooks – Great for a sole proprietor. The invoicing and invoice process is amazing. Easy to use. At the end of day it is most important to keep ontop of the numbers. Know your numbers, know your system, have a process and be successful. Here is a list of some important dates coming up. -For those who file gst/hst annually, filing is due three months after year end. -For those who file gst/gst monthly or quarterly, filings are due one month after the reporting period. Corporate Year End filings are due 6 mos after the year end. Get ahead of your taxes. Have your prior year end filings. Make sure you books are up to date. TIP: Sign up for “my business account” through CRA and have all your small business taxes in one place with easy access. A. Is my business really profitable? B. Am I actually making what I could be making or should be making right now? C. Where am I over spending or should I be spending more on a particular expense? A financial forecast and budget play an important role. First and foremost, budgeting and forecasting are getting you to think about numbers and strategies. They are the driving force that makes you want to get up and do what you have to do. Its honestly one of the tasks that really adds value. The budget is essentially a plan of how the money is going to roll in and out for a period of time. What are the necessary expenses that are specific to your business? it basically creates your chart of accounts. A forecast on the other hand is more big picture. It shows you what your business could look like after a period of time. What is the revenue that needs to come in to cover those costs and expenses? Its a benchmark. Its like the protein shake or the two eggs in the morning you eat before hitting a body pump class. Both tools will also change. If you keep up your bookkeeping — which isn’t so overwhelming when you have a plan and have an idea of the numbers, you can see what is actually happening in comparison to what you predicted and make necessary smart changes. It could be that your original budget didn’t include an unexpected cost. Maybe you don’t need to spend as much on marketing in the next quarter or change the way you are marketing to bring in more business. Maybe you need to raise your prices. Is it a good time to hire a contractor? These tools get you thinking BIG, they allow you to really know your business and pave a road for you to be successful in a shorter amount of time then if you are just flying blind. Create a budget and forecast and get into that mindset. Look for an accounting system that offers these tools and make sure that you keep your books up to date. Payroll is one of the largest expenses a business has. There are also so many elements and processes that come with payroll. When you have employees who work for you and are representing your business you want their pay to be seamless. No issues. There is enough to deal with already when running a small business, that the last issue you want is an unhappy employee because holiday or vacation pay was missed or an ROE was issued incorrectly. Even if you have only one employee it is really important to make sure that proper deductions are being made, remittances are filed and paid on-time and the numbers are being recorded properly. The penalty can get up to 20% for remitting late. From a personal stand point, I always suggest outsourcing payroll as the best option, but if you have only 1 or 2 employees and you don’t want to outsource or use the payroll function in your accounting system yet, then there are options. CRA has a free calculator called PDOC. Payment evolution goes a step further and offers a free plan where you can use their calculator but also get electronic payslips and tax forms are completed such as a T4. Now in this free option, you cannot print the reports, but you do have the information to fill out the necessary forms that you can find online. Have a look at the free option and what it offers. When using free options, just ensure that you have a good spreadsheet to track things as well. At the end of the day, having a payroll system is necessary. TIP: Set up your tax filings under your online banking. 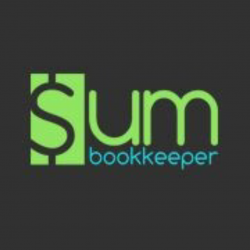 Visit us today at Sum Bookkeeper. Keep bookkeeping simple with tips and tricks. A really helpful money and time saver is having someone come in that can set up your books properly. I am not saying you need to hire someone monthly. Just have someone come in and ensure you have a handle on things. I’m talking tax accounts are setup properly if required. Online filings where possible are set up and ready to go. You have only the necessary accounts in place that reflect your business. You have reports at your fingertips and know what you need to be looking at. Your accounting system is working at its max in terms of automating data entry where possible making life easier, this is naming a few. Once everything is in place properly it allows for an efficient process. Having that process can make certain things less complicated as they arise. In the beginning you the business owner may be doing the bookkeeping and having that understanding of what to do and what needs to get done can really make a difference. Even if you get behind at least you have the framework in place that really can save you. Then when it comes time to hire a bookkeeper, the process is there already allowing him or her to work more efficiently which again saves time and money. Visit us today at sumbookkeeper.com. We have all heard the expression, “write it off”. Unfortunately writing it off doesn’t mean we get our money back or that the cost disappears. Sometimes I wish that it did. Those meals we take clients to or that amazing laser jet printer we buy are what reduce our taxable income. Those business expenses have the potential to move us into a smaller tax bracket. “Save your receipts” I know, I know its annoying, but capturing all of our business expenses can save money. How many businesses get caught at year end in the mad dash. I can tell you a lot of them do. Receipts are missing or cheque stubs are missing. Start up costs are forgotten. Stress levels are high and this is why we hate this part of the business. Really the only solution to this problem, is having a process to manage expenses and stick to it. I wish I had a more super duper answer but I can tell you, the savings can be huge. What I have started to do is use the quickbooks online app. There is a feature where I take a picture of my receipt and can have it categorized and stored. Get ahead of your bookkeeping and control your expenses. Visit us today to help you get set up for success.